Omega Fire Ministries General Overseer says it has received with bewilderment the purported claim by Stephanie Otobo that she has become born again after previously accusing Apostle Suleman of having an amorous relationship. 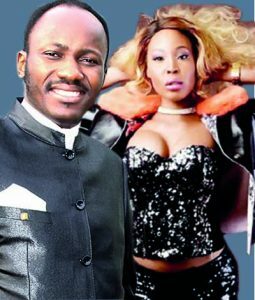 The General Overseer of Omega Fire Ministries Worldwide, Apostle Johnson Suleman, on Sunday, advised his Canada-based accuser, Stephanie Otobo, to confess her sins for the allegations levelled against him before claiming to have repented, Punch reports. While urging the public to take her claim of being ‘born again’ with a pinch of salt, the cleric said Otobo must provide answers to some salient questions over allegations that he had amorous relationship with her before she could be believed. 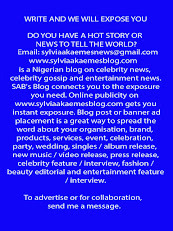 Suleman in a statement by his Communications Manager, Phrank Shaibu, expressed doubts about Otobo’s new claim of being born again, coming on the heels of the fresh suit instituted by her against him in Canada. He stated, “A girl, who lied that she had her marriage introduction in the Apostle’s office, should be honest enough to do her damage control in the office of the court where she filed her suit by providing supporting proof rather than this suspicious ‘handing it over to the Lord’ when the time came for her to have her day in court. Part of the statement read thus: "After besmirching the reputation of a man that she has never physically met, Stephanie Otobo, who filed a suit for $5 million against Apostle Johnson Suleiman in a Canadian court in abuse of court process now claims she is born again and wants to put the whole saga behind her and forget the matter and withdraw the case?" "Not so fast. Where are the explosive incontrovertible evidence she, Festus Keyamo and their team of jeer leaders promised Nigerians? Where are the travel documents she promised to reveal? Where are the pictures she claimed to have? "The 33 year old officially 23 year old girl who made history by being the only woman to miscarry a baby from her backside rather than her front side (as she claimed) now wants to forgive and forget?" "Her father called her a liar, her mother called her a liar, her best friend said she was a blackmailer and when given the chance to prove them all wrong she suddenly becomes born again? The statement added: "Psalm 51:17 says "a broken and contrite heart you, God, will not despise. Contrition requires remorse and confession. If Stephanie Otobo is indeed born again, we welcome it, but we need to see proof of that and the proof is her confession that she lied or her provision of proof that she did not. "This girl, who has undermined the faith of many through her lies wants to get acceptance without doing penance for an act of wickedness motivated by finance! "A girl who lied that she had her marriage introduction in the apostles office should be honest enough to do her damage control in the office of the court where she filed her suit by providing supporting proof rather than this suspicious handing it over to the Lord when the time came for her to have her day in court." "Apostle Johnson Suleman has refused to be blackmailed and his refusal has frustrated his accuser and her sponsors who now hope that this issue will die a natural death but you cannot play with The Lord's servant and now go to Him without first confessing.